"The days of sitting in your driveway to listen to the end of your favorite song or compelling news broadcast may be over soon. Ditto on worrying about where you put your house keys. A newly formed industry consortium, the AllSeen Alliance, wants to advance the adoption of the “Internet of things” through an open source framework. The Internet of things is based on the idea that devices and objects can connect to each other for seamless sharing of information and coordinated operations." "In this video, IEEE.tv sits with IEEE Member Roberto Minerva, chair of the IEEE Future Directions Committee Internet of Things working group, to discuss the privacy concerns of IoT, as well as its many beneficial applications, particularly in medicine." "The "next big thing" is the Internet of Things, a world of networked devices equipped with sensors and radio-frequency identification aimed at interconnecting all things electronic to make them more intelligent and programmable..."
"A pillar of the Future Internet, the Internet of Things (IoT) will comprise many billions of Internet-connected objects (ICOs) or "things" that can sense, communicate, compute, and potentially actuate, as well as have intelligence, multimodal interfaces, physical/virtual identities, and attributes. The IoT incorporates concepts from pervasive, ubiquitous, and ambient computing, which have been evolving since the late '90s and have now reached some level of maturity. It fuses the digital and physical worlds by bringing different concepts and technical components together. Along with the World Wide Web and mobility, IoT potentially represents the most disruptive technological revolution to date. With billions of ICOs and a diverse abundance of sensors, the IoT will be an enabler of ubiquitous sensing." The Internet holds great promise for medical devices, but security issues, lack of standards, and other issues have slowed adoption. Download this whitepaper to see how new software is accelerating the process. "It’s predicted that by the year 2020, 50 to 100 billion things will be electronically connected in the Internet of Things (IoT), fueling technological innovation by creating the means for machines to communicate many different types of information with one another. The IoT is a future where people and objects communicate in unprecedented ways..."
A wide range of researchers from academia and industry, as well as businesses, government agencies, and cities, are exploring the technologies comprising the Internet of Things from three main perspectives: scientific theory, engineering design, and the user experience. "The next phase of the Internet is on its way: a world of networked smart devices equipped with sensors and radio-frequency identification, connected to the Internet, all sharing information with each other without human intervention. Known as the Internet of Things (IoT), it will link approximately 50 billion machines and devices by 2020, predicts Cisco Systems futurist Dave Evans." "It is happening. More and more objects (mostly sensors so far) are connected to the Internet..."
"The Internet of Things is one of our favorite trends at RWW. 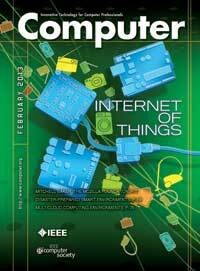 When it finally becomes ubiquitous, we'll be that hipster blog that liked IoT before it was cool. To help usher in the future, the Danish Alexandra Institute has just released a comic book called "Inspiring the Internet of Things," which explains the benefits of networking everyday..."